James Starley (1830 – 1871) was an English inventor and is known as the father of the bicycle industry. He was one of the most innovative and successful builders of bicycles and tricycles. His inventions include the differential gear and the perfection of the chain drive. Starley was the son of Daniel Starley, a farmer. He began working on the farm at nine, showing early talent as an inventor by making a rat trap from an umbrella rip and a branch of a willow tree. He ran away from home as a teenager and went to south London. There he worked as an under-gardener, in his spare time mending watches and creating devices such as a mechanism to allow a duck to get through a hole in a fence, closing a door behind it if a rat tried to follow. Starley’s employer, John Penn, bought a rare and expensive sewing machine. Starley mended it when it broke down and improved the mechanism. Penn knew Josiah Turner, a partner of Newton, Wilson and Company, the makers of the machine, and in 1859 Starley joined its factory in Holborn. Turner and Starley started their own Coventry Sewing Machine Company in Coventry around 1861. Turner’s nephew brought a new French bone shaker to the factory in 1868. The company started making bicycles and Coventry soon became the centre of the British bicycle industry. 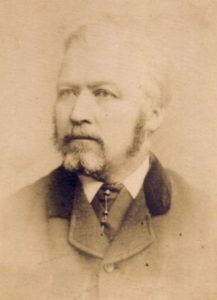 Starley’s sons continued manufacturing cycles after his death in 1881 but his nephew John Kemp Starley made more of a mark. 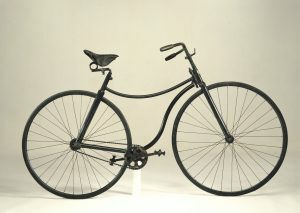 It was John Kemp Starley and Sutton who devised the recognisably modern Rover safety cycle with 26-inch wheels (still a standard size), chain drive, and a diamond-shaped frame (no seat-tube as yet) in 1884, showing it in 1885. The penny-farthing or ordinary cycle was not safe, with a “header” accident an ever-present danger. Others had experimented with chain-driven “safety cycles” but the Rover made its mark to the extent that “Rover” means “bike” in countries such as Poland. John Kemp Starley (1854–1901) was an inventor and industrialist from England who is widely considered the inventor of the modern bicycle. 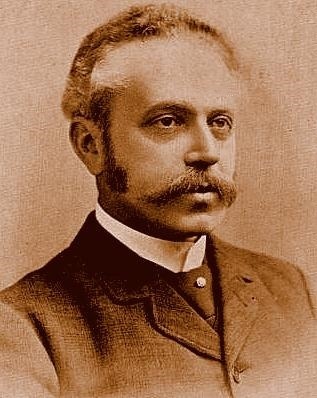 Starley was born on 14 December 1854 and lived on Church Hill, Walthamstow, London. In 1872 he moved to Coventry to work with his uncle James Starley an inventor. He worked with his uncle and William Hillman for several years building cycles for Ariel. In 1877, he started a new business Starley & Sutton Co with William Sutton, a local cycling enthusiast. They set about developing bicycles that were safer and easier to use than the prevailing penny farthing or “ordinary” bicycles. They started by manufacturing tricycles, and by 1883 their products were being branded as “Rover”. ‘Wheels within wheels’, Williamson (1966); ‘A History of Rover Cycles’, Pinkerton and Roberts (1998) ,Waltham Forest Local Studies Library, Vestry House Museum; Steve Roberts, animator, Walthamstow.